PUBLISHER: Joseph Knight Company, Boston, 1892-? ABOUT: Incorporated 1892 from Nims & Knight. 1892-1894 PTLA: Family Edition of the Poets. Lucile. By Owen Meredith, fully illustrated, and handsome borders around each page. 1 vol., octavo, cloth, gilt edges, $2.50; 1 vol., octavo, full American seal, padded, flexible, gilt edges, $4.00. 1 vol., full fancy embossed leather, padded covers, round corners, $4.00. 1895 PTLA. Family Edition of the Poets. Lucile. By Owen Meredith, fully illustrated, and handsome borders around each page. Each in one vol., octavo, cloth, gilt edges, $2.00; each in one vol., octavo, full American seal, padded, flexible, gilt edges, $4.00. Dainty Gift Books in Fine Binding. Lucile. By Owen Meredith. 1 vol., 16mo, with photogravure frontispiece, plain cloth, gilt top, $0.75. 1 vol., 16mo, with eight photogravure illustrations, white and gold ornamental binding, gilt top, $1.50. 1 vol., 16mo, half levant morocco, gilt top, $3.00. [Cut of Browning title in "white and gold" format]. Ivorine Series of Dainty Gift Books. The following volumes of our well-known line of dainty gift books appear in a new dress. Each book is carefully sewed and gilded, and tied with silk ribbon in a flexible Ivorine cover, and fluted edges, with hand-painted decoration and title. Lucile, $1.50. [Cut]. PW 28 Sept 1895: "Joseph Knight Company, Boston, who make a speciality of illustrated and standard gift-books, have in preparation.... Among the daintiest gift-books will be new editions of 'Lucile', 'Lady of the Lake', 'The Princess', and 'Idylls of the King'." [Described, same issue, in publisher's list as "cl, 16mo, 75 c.; il. 16mo, white cl., $1.50; hf. levant mor., $3.00.]. 1896 PTLA: New Editions of Ivorine Gift Books. 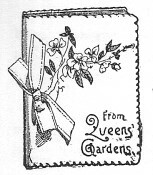 The following volumes of well-known dainty gift books appear in a new dress. Each book is carefully sewed and gilded, and tied with silk ribbon in a flexible Ivorine cover, with fluted edges, and hand-painted decoration and title, boxed. Each 1 vol., 16mo., $1.00. [No cut]. 1896 PTLA: Family Edition of the Poets. Each in one volume, full, flexible American seal, padded, gilt edges, $4.00. [Includes Lucile; cut of Tennyson].